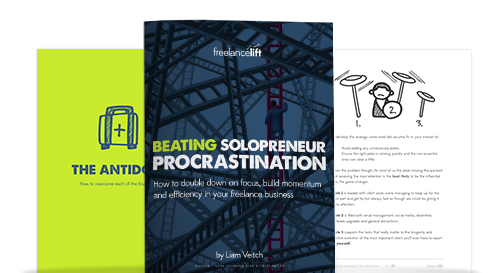 How to double down on focus, build momentum and more efficiency in your freelance business. One of the most frustrating things about being a one-person business sometimes is a lack of progression. Maybe you’re stuck on a plateau or feel as though you’re just treading water. In this short book I wanted to lay out how to double down on focus, build momentum and efficiency by leveraging processes and systems in your freelance business. In doing so I hope to help you break through any plateau.